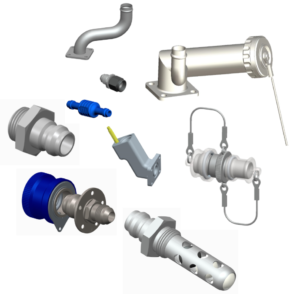 Raycon Industries designs and manufactures a wide range of specialty fittings and adapters. Specializing, but not limited to stainless steel, we can design, and manufacture many popular fittings used in the Defense and Aerospace Industries. When you need something special to meet your needs, Raycon Industries is your go to source. We are fully equipped with a wide range of the latest CNC equipment, in-house design, and a staff of experienced assembly personnel to meet your demanding requirements. Contact Raycon Industries for your requirements.